What happens when you have a medical emergency on a plane? Who’s going to help if a pregnant woman expectantly goes into labour, or if someone suffers cardiac arrest? You guessed it! Your flight attendant will spring into action. Now don’t get me wrong, the first thing we’re going to ask is if there is a medical doctor on board. But obviously we can’t hope for that, we must be trained in how to handle a medical situation. Our aircraft are equipped with first aid kits, medical emergency kits, AEDs, and to clean up after: a biohazard clean up kit. Wait a second! What’s the difference between a first aid kit and an emergency medical kit? First Aid kits are located throughout the aircraft and are generally used to address less serious medical situations such as cuts, broken bones, burns, etc. A medical emergency kit is more designed to deal with life threatening situations, such as cases where we need to open someone’s airway, times when an IV may be needed, or other serious situations. We also have a contract with a company called “Medlink” who has doctors available 24/7/365. In a medical situation we can contact the company to get help over the phone. This way we can give the best possible care to a passenger who needs it while in the air. In training so far we’ve only touched on medical emergencies, but later we’ll be getting our certification for occupational first aid. This is something I already have (simply because it’s good to know! ), however I will be required to get recertified. This is to ensure all crew can be as useful as possible in a medical situation. They’ll also teach us how to use our first aid skills in an aircraft environment. This is something that isn’t covered in an average OFA course. The simple fact is when there is an emergency in the air (Medical or other) there is no help coming. Your flight attendant is the person who is there to save your life. 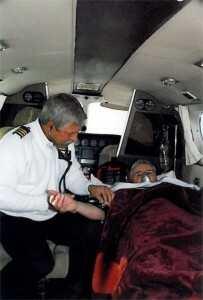 What I’ve found surprising is how often FAs are dealing with mid-flight medical emergencies. It happens far more often then even I thought. Also to all the doctors, nurses, and EMT who fly often: Thank You! Ah yes! My favorite subject. I’m glad that FAs are so well trained. When I few regularly, I always identified myself as an RN to one for the FA’s when boarding, to offer my services as necessary. I’ve been called upon twice over 35+ years and with luck, both situations were very minor. We’re always willing to help when necessary. That’s what WE are trained to do! Us flight attendants really appreciate it when qualified medical personnel identify themselves when boarding. Medicals on the aircraft are far more common then people think and knowing where a doctor, nurse, or EMT is in advance can save someone’s life. THANK YOU!